At Sugar Creek Baptist Church we just opened a new Family Center. In this new building we have about four rooms with media support and the two larger rooms have Yamaha digital consoles. I was very excited about have features such as offline editing, on board effects, and networking. I have been very surprised at how much I like the the M7CL-32. 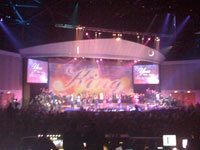 In our worship center we have a Digico CS-D5 which has been great. I was very pleased at how easy it was for me to pick up the M7CL and how some of the features were similar to the Digico. Now I have only mixed on the LS9-32 once, but as of yet I’m not a big fan of the console. I seem to have to keep my head in the board too much while mixing. The touch screen really helps with the quick changes. I have one large disappointment with both of the consoles. This last Thursday, I finally got some network wire pulled to both of the consoles and tried to place them on the network. All was going well until I went to adjust the subnet mask. Come to find out, the firmware only supports class C subnets (255.255.255.0). So let me tell you what that means. With that mask you can only have 254 devices attached to the network. Well that is fine for many groups that might be using the console, but for use in larger churches or conference facilities it is just too small. The part that I really don’t get is the interface is built to change the subnet options, it is just disabled. Very frustrating. So now I’m going to have to build a dedicated network to access these consoles. Yamaha please fix this issue!!!! Just though that some might be interested. 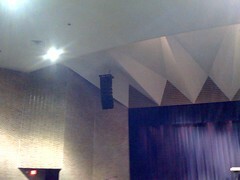 UPDATE: The choir concert was acoustic, didn’t even used the sound system so I guess I won’t know about the line array. This week we are installing a couple of new DSP units in the worship center. BSS London Blue 80s are the new brains for our audio system. In the process of testing everything last night we found the the protection circuits are bad in three of our EAW MH-662iA speakers. This has been limiting some of the high frequencies from the main center cluster. Now we have to figure out how to fix them. So again I will be excited to hear what the system is going to sound like after we get this fixed and our system tuner James Young is done with the DSP upgrade and room tuning. Going to be a fun Sunday. PERSONAL: Just a quick personal note, it was awesome to see Brittney (my daughter) worshiping on stage Sunday in the Edge service. It brought me great joy.